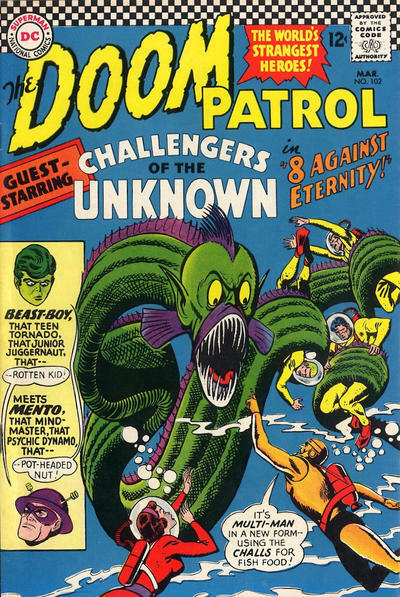 I may love the Doom Patrol, but sometimes even their adventures are a bit lame. This one was all about Multi-Man resurrecting some ancient sea-dwelling soldiers and attempting to...take over the world, I guess. It also features fricking Mento, whom I hate. Rita Farr is a lovely character in this series, always the peacemaker, but never afraid to put herself in the way of danger. But in a few issues, when Mento somehow convinces her to marry him, the character falls apart for me. The issues of the series that feature Mento are amongst my least favourite. There's just no reason to have him as part of the series, as far as I'm concerned. Can you tell I don't like Mento?